Thank you Maria and Zhivko for introducing us to teachings, emotions and feelings I didn’t know existed. Swami Bharti was our special guest directly from “Oshodham” Delhi, India who in 3 short days gave us a glimpse into the practices and principles of Osho meditation. We laughed, cried, giggled, danced, jumped, hugged, played, held each others’ hands and most importantly turned our sight inward, put a pause on the hustle and bustle outside, and reflected on what’s really important and what makes our heart beat faster. Jivko led the Integral Healing Flow, which for most of us was the epitome of the retreat and the practice we’ll always remember. Practicing Integral Healing allows you to connect your inner energy with the forces of the universe around us and channel that energy through your body into positive thoughts and behaviors, thus helping and healing your tribe. You have to experience it to believe it! Follow Ananda Yoga Project on Facebook and don’t miss their next yoga retreat in October. Can you remain open to the situation when you are completely uncomfortable? Can you be kind and loving to strangers you meet only via energy, emotions and touch, when at times your eyes are closed and where talking is frowned upon? Can you stay flexible with your body, mind, schedule and attitude when you actually want to retract deep into your shell and go back to your comfortable routine? Every day of the long weekend retreat started with a 5am wake up call to greet the sun and dance Panevritmia for 30min (Petar Dunov’s sun worship teachings) followed by 1.5 hrs of vigorous Prana Vinyasa Flow yoga “Shiva Rea” style until you collapse on your mat soaked in early morning sweat. All that before 8am and even before breakfast. From 10am to 7pm different sessions of dynamic Osho meditations were offered interspersed only by tea pauses and lunch. After 7pm we would go to dinner and after 9pm there was even more time for group reflection and mindful sharing. 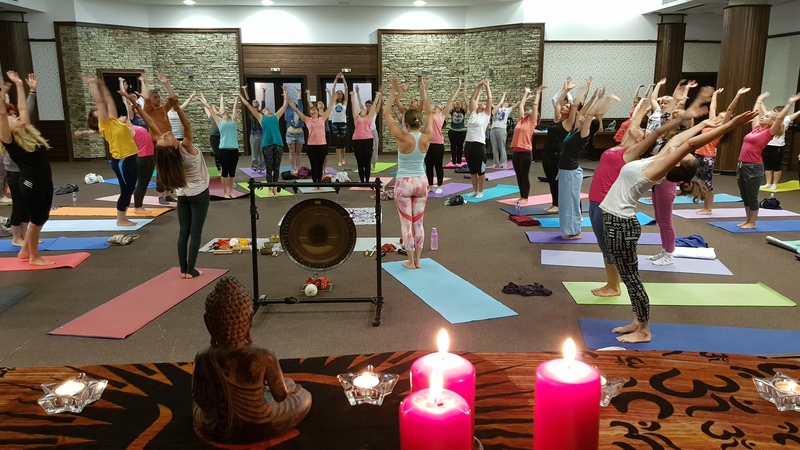 The retreat was held at a 5* hotel in Bansko with luxurious accommodations, full board, and free use of the outside/indoor pool and spa. Spending time with like minded people also offered us a mindful opportunity to escape (even if for just a few short days) the temptations of modern society. Nothing was forbidden or frowned upon, just certain things were suggested to refrain from. The menu was completely vegetarian yet we didn’t lack calories or nutrition. Smoking, excessive drinking, hard feelings and random talking were NOT recommended. We attempted to clear and liberate the soul and focus on mindful movement and mindful communication only. Since the hotel had a scenic outdoor pool and a heated indoor pool with a full spa, hot tubs, dry sauna, steam bath, russian bath, rainshower, and cold plunge, we enjoyed the power of water and rested sore muscles and bruised souls daily. 🛁 Don’t ever underestimate what a dip, a swim, and a soak can do to your body! And for those of us who like to indulge in the healing powers of nature, there was the opportunity for daily hikes at various times. The hotel was situated at the foothills of Pirin National Park and restless me managed to explore woods, glacial lakes and high mountain peaks 2 days in a row, despite the rainy weather. At the end, I just wanted the weekend to last, I didn’t mind waking up before sunrise or being quiet in meditation or vegetarian any more. I JUST wanted my new family to stick around for a little longer, holding me in their arms a little tighter. I had the most wonderful feeling of deep gratitude, extreme calmness, and true and pure love for everyone attending. I know every single of them would do what had to be done to save my life/soul if it were on the line. Ananda Yoga offers daily classes at their studio in Plovdiv. You can check their schedule here and perhaps meet me at Vinyasa Yoga which I frequent weekly when in town.